NEW: Obama says dollar "is extraordinarily strong"
BEIJING, China (CNN) -- China, flexing some of its might as a growing economic power, has suggested overhauling the global monetary system by boosting the use of an alternative to the U.S. dollar. A customer exchanges U.S. dollar notes at a bank in Beijing, China, on Tuesday. As the largest holder of U.S. debt, China has expressed concern about its investment if the dollar should collapse. On Monday the governor of the People's Bank of China proposed expanded use of an alternative -- the International Monetary Fund's SDR, or Special Drawing Right, an accounting unit based on the euro, Japanese yen, pound sterling and U.S. dollar. "Special consideration should be given to giving the SDR a greater role," Zhou Xiaochuan said Monday. Wider use of SDRs would ease dependence on any one currency and limit the effects of a single country's fiscal policies, Zhou said. For Americans, that could mean higher interest rates for loans of all types, including mortgages and credit cards. 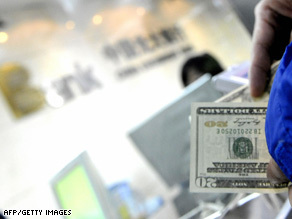 Though the statement reflects China's unease with the long-term prospects of the dollar, it was not a major factor in the currency market on Tuesday, said Kathy Lien, director of currency research, at Global Forex Trading. "I don't think market is reacting to [Zhou's comments], because the dollar is rising, not weakening," she said. In his news conference on Tuesday, U.S. President Barack Obama said he didn't believe there is a need for a global currency. "I would just point out that the dollar is extraordinarily strong right now. And the reason the dollar is strong right now is because investors consider the United States the strongest economy in the world with the most stable political system in the world," Obama said. China has an estimated $2 trillion in foreign reserves and is the United States' largest creditor, having bought more than $1 trillion of its debt. Despite its concerns, Beijing will keep buying Treasuries, even as it keeps a close eye on their value. "Investing in U.S. Treasury bonds is an important component of China's foreign currency reserve investments," Hu Xiaolian, deputy governor of the People's Bank of China said this week. "We are naturally relatively concerned with the safety and profitability of U.S. government bonds." Chinese Premier Wen Jiabao expressed similar concerns earlier this month. "We have loaned a huge amount of money to the United States," Wen said. "Of course, we are concerned about the safety of our assets" and "call on the United States to honor its word and stay a credible nation and ensure the safety of Chinese assets." Washington is spending trillions of dollars to shore up the the U.S. economy, including a stimulus package, bailouts of top American industries and the purchase of billions of dollars in bad bank assets. Those programs could undermine the dollar, making China's investments less valuable. But China's purchase of U.S. debt helps, in a sense, to underwrite Beijing's success. By helping to underpin the economy of a top trading partner, China ensures that there will be a market for its consumer goods.